The Kandinsky Black and White Cuckoo Clock is a beautifully simple yet striking piece you would love to have inside your home. What makes it so special? Well, the looks alone is enough to rave about. It features two discs, one in black and the other in white. They slightly overlap, creating this beautiful eye catching design. 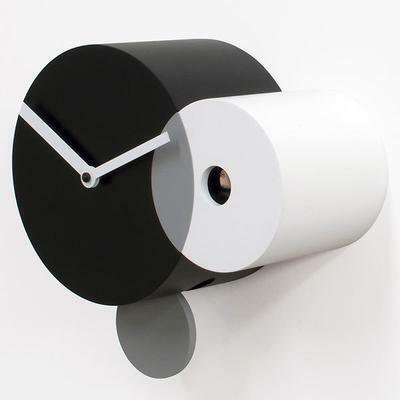 The wooden monochrome clock is actually inspired by the great artist, Wassily Kandinsky, who is famous for his study of colour and shape. For this piece, there's actually a small cuckoo bird hiding at the centre of the white circle. It comes out every hour to tell you the time. 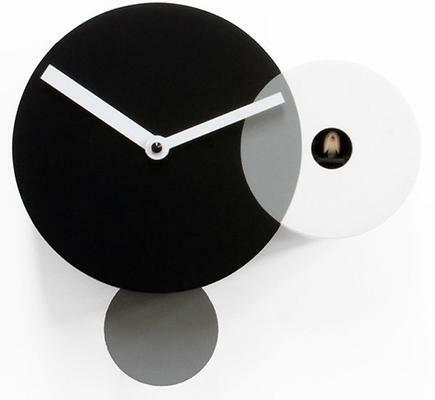 The black circle, on the other, holds the white clock hands in place. At night time though, there's a light sensor which deactivates the cuckoo bird to prevent any disturbance during your precious sleeping hours. This is a beautiful timepiece worth having so go ahead and enjoy it!